Congresswoman Cynthia McKinney Called Her Spokesman Coz Carson a “Fool”. Video Link! As if things were not already bad enough for this nut. Now she’s been caught with her mic on, bad mouthing a member of her staff. In a forgot the mic was on moment, McKinney said this about her spokesman Coz Carson, after being asked about the incident involving her punching a Capitol Hill police officer. Oh crap now you know what… they lied to Coz and Coz is a fool. See the actual video here. After saying Coz is a fool, she attempted to tell the media that they cannot use her comments that were not made at the table. Well we know, the American media is free to report on any slip made by a politician. We don’t live in some draconian society, where non-national security related slips cannot be reported by the media. And we know our media might even report it if it risk national security ,or causes a riot in foreign lands. In fact, those seem to be some of the stories they enjoy reporting on the most! Sorry McKinney, you obviously thought you were in one of those pro-Islamist, radical funding, Arab nations you spend so much time defending. 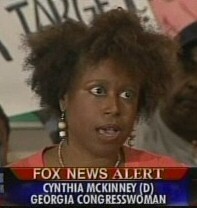 Cynthia McKinney?s Spokesman Coz Carson is an Idiot Racist! Disrespectful Cynthia McKinney Punches a Cop. He?s Pressing Charges! McKinney Files for Re-Election. Hank Johnson Says She Has Failed to Deliver.